This natural, slab avalanche occurred sometime during our recent storm that passed through April 4th and 5th, 2019. Precipitation began at 0900 on the 4th and ceased at 1400 on the 5th. Snow struggled to accumulate yesterday but piled up quickly last night/early this morning. Snow totals ranged from 11 inches below treeline to 13 to 15 inches near and above treeline. Snow/water equivalent for the storm was just under 3 inches of water. This avalanche was fairly recent and failed about halfway through the new snow at a 1F to 4F density change. It likely occurred during a period of rapid warming when the sun attempted to come out this morning. The moist, 6 to 8 inch slab gouged out softer layers of storm snow below to create a decent debris pile at the slope terminus. Until better visibility allows, the size and extent of this avalanche is unknown. 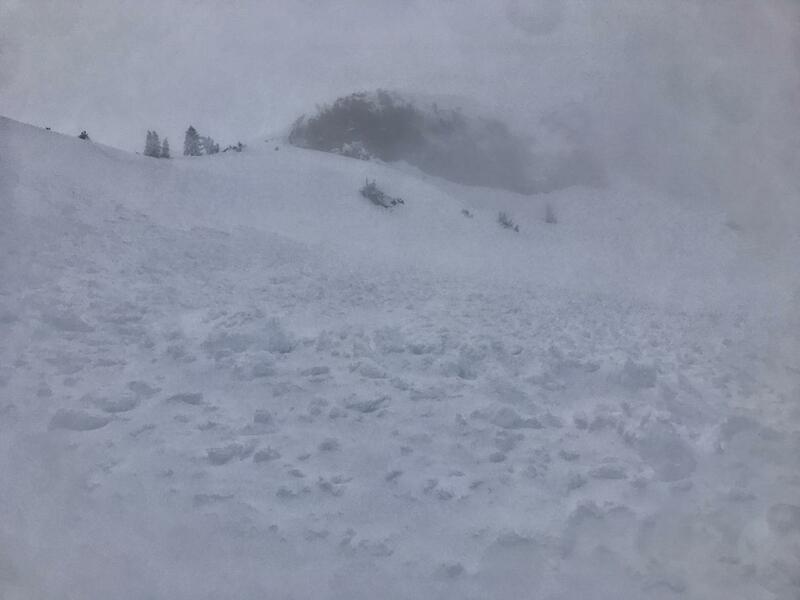 By the looks of it, it's possible the entire east aspect of Green Butte may have slid and been part of the avalanche observed/pictured. Below the recent storm snow, 4 inches of super saturated, very wet and weak snow exists from previous rain on snow. The interface between the new snow and super saturated snow below is bridged by a harder crust. During stability tests, it took hard force to cause failure in the wet, weak layer. While the avalanche failed on a different layer, this wet, weak snow should be monitored as several more inches of water (read: a lot of weight) is forecast for this weekend. Propagation on a slope scale does not seem likely at the moment, but by Sunday, could be possible from either rain on snow or fresh, heavy snow. Despite below freezing temperatures today, at times the solar radiation was intense through thin clouds and the atmosphere felt like a giant greenhouse. Visibility was horrible most of the time. A few donut holes of blue sky attempted to dominate, but fog, mist and low clouds reigned. The cloud deck lingered at 6,000 feet, obscured above and mostly clear below. Showery precipitation in the form of graupel, sleet, snow and mist was all encountered within a 2 hour period late in the afternoon. The wind was out of the south, primarily light with moderate gusts. New snow was moist enough that no wind transport is possible currently, and previous wind effect was minimal. The avalanche danger in our snow climate is already a fleeting thing during the winter, often rising and falling quickly with storms. This time of year, avalanche danger can fluctuate even faster, and rapid warming is common. After a spring snow storm, the very instant the snow is even remotely exposed to the sun, the effects can be felt and the avalanche danger can spike very fast. Rapid warming, remember, is one of the five red flags of avalanche danger and comes into play most often in the spring. Snow does not like rapid change and this is what happened in this avalanche case. It's unknown if there were other avalanches like this one. Temperatures are forecast to continue to warm this weekend.